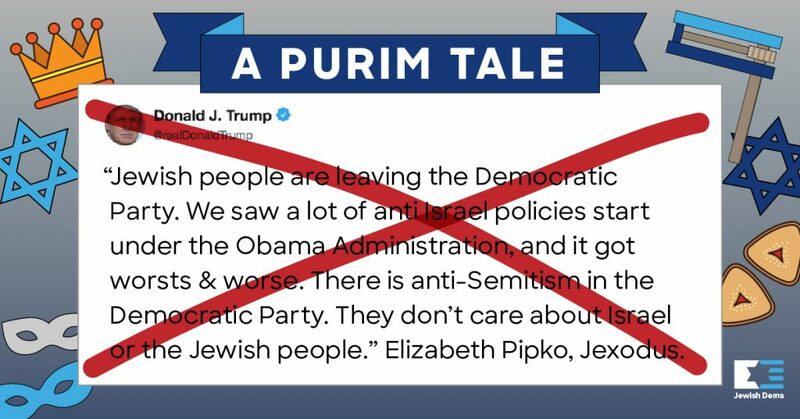 Purim Tale or Trump’s Twitter account? With Purim right around the corner, we at the Jewish Democratic Council of America (JDCA) considered writing a Purim parody. But nothing we came up with could match the absurdity of President Trump’s Twitter feed. This week, the President of the United States, the leader of the Republican Party, the man who equivocated instead of condemning white supremacists, had the audacity to falsely claim that Jews were leaving the Democratic Party because it “hates Jews.” Even this morning, he continued to tweet about Jews, treating us as no more than political pawns. If that kind of rhetoric were as funny as it is untrue and offensive, it might be appropriate for a Purim spiel. Unfortunately, Trump wasn’t joking so we’re skipping the spiel and focusing on the truth. The truth is that the Democratic Party is and will remain the home of Jewish Americans because Democrats support policies that are aligned with Jewish values. The truth is that the Republican Party has lost support of Jewish voters since Trump has been in office, down from 24 percent in the 2016 election to 17 percent in the 2018 midterms. The truth is that the Democratic Party has gained support of Jewish voters – including from some Jewish Republicans and Independents – up from 71 percent in the 2016 elections to 79 percent in 2018 midterms – because Trump’s policies are so antithetical to Jewish values on nearly every issue. And the truth is that President Trump has repeated anti-Semitic tropes and conspiracy theories from the campaign trail to the Oval Office, and the Republican response has been silence. JDCA has been quick and unequivocal in its denunciation of anti-Semitism. Last week, JDCA condemned Rep. Ilhan Omar’s use of anti-Semitic tropes and welcomed the unanimous Democratic denunciation of anti-Semitism and other forms of intolerance on the House floor. We – and the majority of Democrats – have called out anti-Semitism whenever and wherever it has emerged, on both sides of the aisle. Republicans, on the other hand, have been selective in their condemnations of anti-Semitism. While they were quick to condemn Rep. Omar, they have been silent for over two years in the face of a president and other Republicans who have trafficked anti-Semitic conspiracy theories and invoked anti-Semitic tropes. Now, Republicans such as Rep. Liz Cheney – who was one of 23 Republicans who opposed the House resolution condemning anti-Semitism – are trying to fundraise off of the president’s false claims regarding anti-Semitism and Jews. The president himself continues to tweet about the Jewish vote, and we’re pushing back. This morning, in response to the president assault on the truth, we asserted that “Jexodus” is a Republican fantasy that will fail. The term itself is an anti-Semitic trope, and we reject his treatment of Jews as political pawns. Republican attempts to literally and figuratively cash-in on this moment demonstrate their willingness to politicize this very serious issue, and we denounce it in the strongest possible terms. A lot happens every week, but we can’t cover the whole megillah in an email. Stay informed in real-time by following JDCA on Facebook, Twitter, and Instagram. Our work is not possible without your support, and we thank you for standing with JDCA as we fight for socially progressive, pro-Israel, and Jewish values.